Gastric carcinoma is a malignant disease, and gastric adenocarcinoma (GAC) is the most common histological type. Molecular profiling of GAC has been extensively performed, but few have focused on the clinical significance of gene clusters of the cell cycle. We investigated the genetic profile of cell-cycle-associated genes in a GAC cohort. The mRNA expression and clinical data were downloaded from TCGA, according to cBioportal. We conducted a series of analyses to detect the relationships between these genes and GAC. From all the patients, 5 clusters were identified based on mRNA expression of 122 cell-cycle-associated genes. Cluster 1 showed the worst prognosis and is characterized by extremely high expression of WEE2 and CCNE1. Comparison of the gene patterns showed that 16 genes expressed were distinctly varied between each cluster. In addition, investigations into the prognostic role of the 16 genes suggested that high expression of ESPL1 and MCM5 were significantly correlated with favorable outcomes. Moreover, we detected that ESPL1 and MCM5 gene expression were negatively correlated with GAC pathologic stage progression. This study revealed a gene expression pattern of the cell cycle in different GAC subgroups, and suggested individual genes were associated with the clinical outcome and AJCC stages. These results suggest a novel prognostic strategy for GAC and provide information for patient stratification and trials of targeted therapies. Gastric carcinoma (GC) remains the fifth most prevalent cancer and the third leading cause of cancer-related deaths worldwide [1, 2]. Gastric adenocarcinoma (GAC) is the main type of GC and is associated with poor survival rates . Although the incidence of GAC has been reduced over the past years, it imposes a critical issue globally . The characteristics of diverse histological (phenotypes) and genotypes manifest that GAC is a heterogeneous disease . Previous studies uncovered the genetic profiling of GAC by performing gene expression or DNA sequencing, but rare profiling led to alterations of gene panels associated with specific biological events [5–7]. The cell cycle process is a highly organized event and regulated duplication of genetic material and cell division, and aberrant cell cycle activity is a hallmark of cancer . 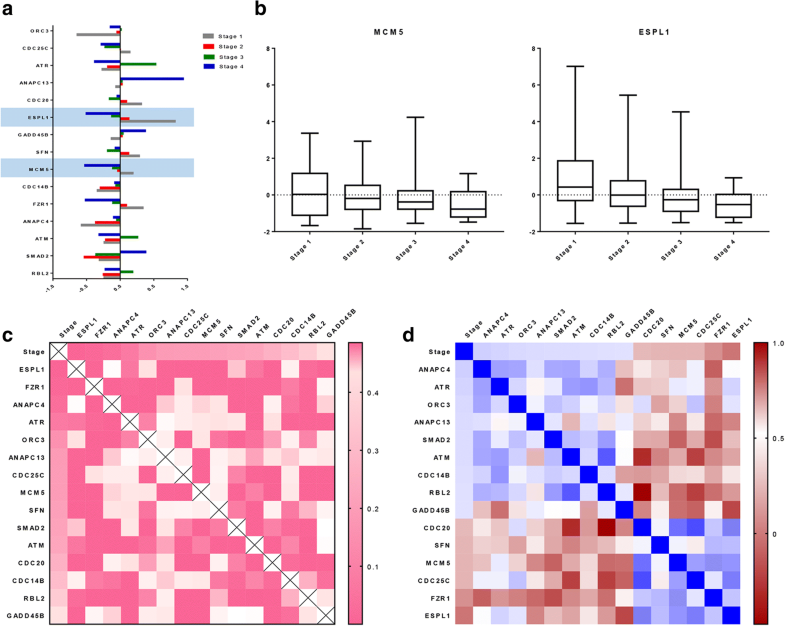 A comprehensive molecular characterization study elicited frequent amplifications of cell cycle mediators (CCNE1, CCND1 and CDK6) in GAC; however, it remains unclear if specific patterns of cell-cycle-associated gene expression across different subtypes or stages bears any significance on patient outcome or is correlated with genetic alterations . Tumor stages are generally used to characterize disease progression and determine metastasis and prognosis . Gene expression involved in the development of GC is also variant in different stages . In this study, we focused on mRNA expressing variations of genes associated with the cell cycle in different GAC subgroups, as well as its correlation to tumor stages. We identified significantly differentially expressed genes in GAC samples and the prognostic impact . Specific genes that impacted the outcomes showed a variant expression panel between different stages. Finally, we report a unique set of cell-cycle-associated genes in GAC that serve as a divider of biological characteristics, which revealed the potential for therapeutic strategy targeting cell-cycle-associated genes. We obtained RNA-Seq data and the corresponding clinical records of 415 gastric adenocarcinoma patients (GAC) of TCGA from cBioPortal for Cancer Genomics (http://cbioportal.org) . We filtrated the data base on whether the mRNA z-score, tumor stage and overall survival were clearly recorded. Collectively, the data set included 228 samples for the clustering study and 206 samples for the stage study, respectively. A panel of cell-cycle-associated genes was derived from the KEGG pathway database (http://www.kegg.jp/kegg/), as previously described . In total, 124 genes were listed; however, mRNA expression data of genes MYC and CCND1 were unobtainable, and the remaining 122 candidate genes were analyzed (Additional file 1: Table S1). Hierarchical cluster analysis of 122 genes expressed in each sample was used to group samples with similar gene expression patterns. Samples with differential cell-cycle-associated gene expression between separate clusters were identified from the whole data set. The expression levels of GAC patients were shown as mRNA z-scores and grouped using the hierarchical clustering algorithm in the Gene Cluster 3.0 program . The heat-map of cluster indication and tumor stage divided pattern was generated using the Java Treeview program . To evaluate the relationship between the cell-cycle-associated genes and patient clinical outcome, we used GraphPad Prism 6 for Windows (GraphPad Software, Inc., California, US; Version 6.01, 2012) for construction and overall survival (OS) comparisons in different gastric adenocarcinoma clusters and different tumor stages. Additionally, OS difference analysis between low and high expression cohorts were conducted in GraphPad Prism 6. Survival curves were plotted using a Kapla-Meier analysis and compared using the log-rank test in GraphPad Prism 6. Associations between clinical characteristics and clustering variable were analyzed by Fisher’s exact test and Pearson/Spearman correlation. Difference of gene expression between clusters was conducted by ANOVA analysis. Correlation between each element was conducted by regression analysis. Both results were performed in SPSS 19.0 (IBM, Inc., New York, US). A P value of less than 0.05 was considered statistically significant. To understand biological functions and utilities of the biological system, we retrieved 124 cell-cycle-associated genes (PATHWAY: map04110) from the KEGG database. Additionally, we selected 122 genes that were detectable and sorted the mRNA expression values from the RNA-seq data of GAC (Additional file 2: Figure S1). The expression levels of the 122 genes were calculated by mRNA z-scores compared to the expression distribution of each gene from tumors that were diploid for the genes in 415 GAC cases (RNA Seq V2 RSEM), based on TCGA data in GC. Following the clinical filtrated criteria, we achieved 228 cases with survival records to perform cluster analysis. Five clusters of GAC were distinguished based on the gene expression panels (Fig. 1a). The statistical analysis of the clinical and histological characteristics of each clusters was performed, and the result shows that the nodes pathologic stages and tumor stages was significantly different (The characteristic of histological types was excluded for the reason of the incompleteness of data) (Table 1). Moreover, correlational analysis showed the significant correlations of the three parameters and clustering situation (Table 1). 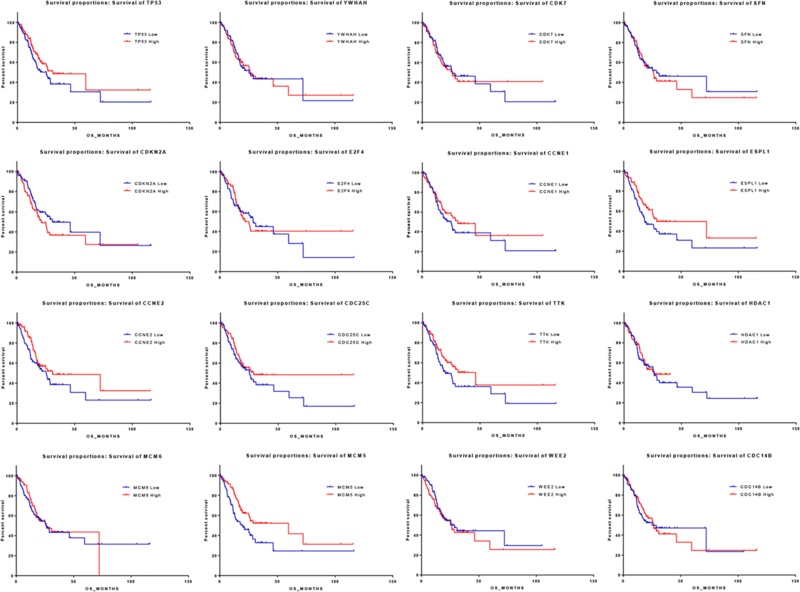 We compared the median survival and survival curves between each cluster further and the results showed that cluster 1 demonstrated the worst prognosis (12.35 months) compared to other clusters (26.31 months) (Fig. 1b). In contrast, clusters 2 and 4 showed favorable prognosis with a median survival of 30.88 months and 26.45 months, respectively (Table 2). 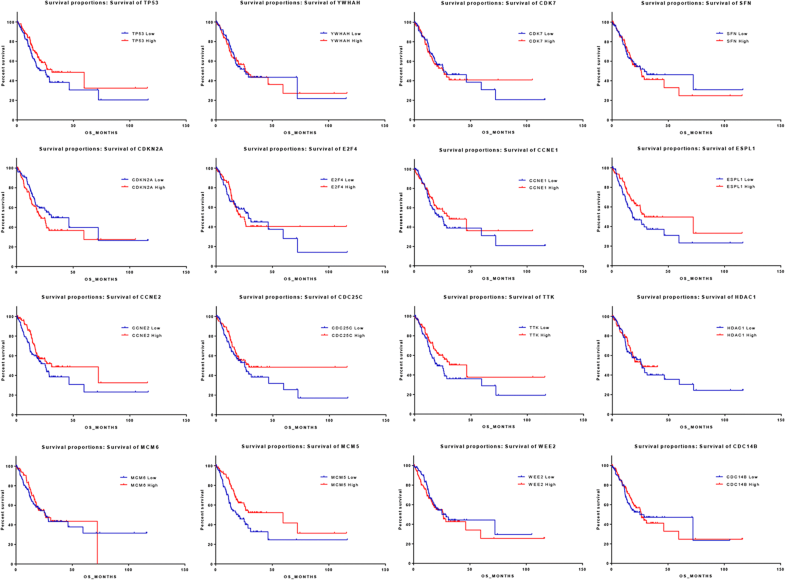 Comparison of survival curves revealed a significant difference between outcomes of cluster 1 and cluster 4 (P = 0.0278) (Additional file 1: Table S2). Additionally, we examined the genes that expressed variation between each cluster. According to the filter criteria of significant difference (P < 0.01), there were 42 differentially expressed genes of cluster 1 versus the other clusters, 32 differentially expressed genes of cluster 1 versus cluster 2 and 38 differentially expressed genes of cluster 1 versus cluster 4 (Fig. 1c). A cross-reference of the three gene groups showed that 16 genes were included in the overlaps (Fig. 1d). A comparison of the 16 genes of mRNA expression demonstrated that WEE2 and CCNE1 were dramatically elevated in cluster 1 (P = 2.89085E-09 and P = 6.96046E-26, respectively) (Fig. 1e and Additional file 1: Table S3). To address the prognostic roles of genes with cluster-differential expression, we evenly divided the samples into two groups based on the mRNA z-scores from high values to low values. Survival curves according to each single gene are shown in Fig. 2. Comparison of the median survival and survival curves in the 16 genes between low-expression and high-expression groups revealed that ESPL1 and MCM5 were significantly associated with clinical outcome (P = 0.0448 and 0.0048, respectively) (Table 3). High expression of ESPL1 and MCM5 indicated a favorable median survival (18.33 vs 28.71 months and 19.94 vs 59.49 months, respectively). In addition, elevated CCNE2 and TTK expression also showed a trend of correlation with good prognosis, but with a non-significant difference (Table 3). To detect the impacted factors of differential gene expression, we filtered out a sample set with intact pathologic records. According to investigating the expression of cluster 1-specific genes corresponding to each clinical manifestation, we detected obvious differences of the 16 genes expressed in each tumor stage (Fig. 3a). 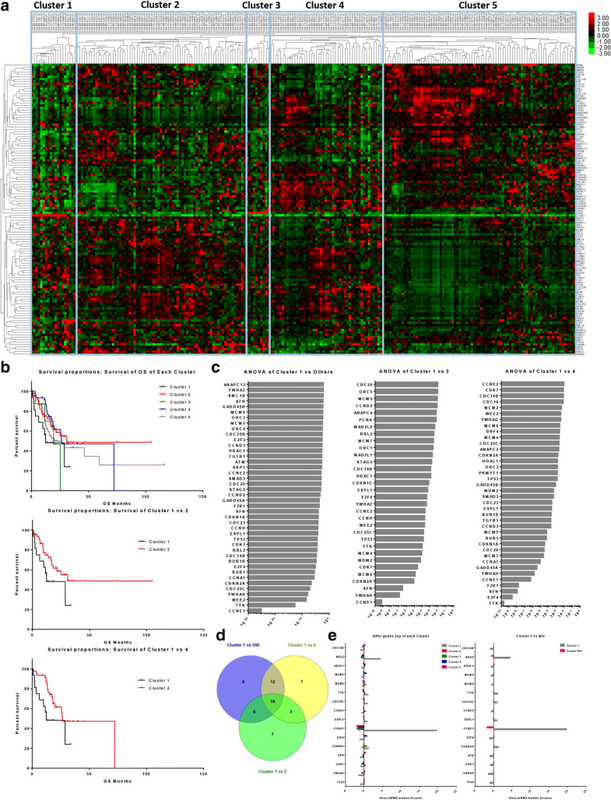 In addition, ESPL1 and MCM5 expression were negatively correlated with tumor stage progression (Fig. 3b, c), and regression analysis indicated that ESPL1 and MCM5 were correlated to tumor stages (Pearson correlation = − 0.25713; P = 9.54E-05 and Pearson correlation = − 0.13982; P = 0.023, respectively) (Additional file 1: Table S4). Additionally, we investigated the correlation between cluster 1 specifically expressed genes and tumor stages. There were 15 genes, including ESPL1 and MCM5, that showed relativity (P < 0.05) with tumor stage changing (Fig. 3b) (Additional file 1: Table S4). A correlation matrix of each gene and stage showed that FZR1 was also weakly correlated with stages (Pearson correlation = − 0.20806; P = 0.001). What’s more, we detected that the expression of ESPL1 was positively correlated with the expression of FZR1, SFN, MCM5, CDC20 and CDC25C and negatively correlated with the expression of GADD45B and ANAPC13. MCM5 was positively correlated with the expression of CDC25C, ESPL1, FZR1 and CDC20 and negatively correlated with the expression of SMAD2, RBL2, GADD45B and ANAPC13 (Table 4) (Fig. 3c, d). In summary, we studied the expression profiles of 122 cell-cycle-associated genes and sorted the GAC samples into 5 clusters according to mRNA z-score distribution. Sixteen specific genes showed differential expression between each cluster that were identified. We examined the prognostic roles of the 16 genes and detected that ESPL1 and MCM5 were significantly associated with overall survival. Moreover, we detected that the expression of ESPL1 and MCM5 were negatively correlated with tumor stage progression. These results suggested the significance of cell-cycle-related gene expression in the development and progression of GAC and provided potential targets for GAC therapy. Uncontrolled tumor cell proliferation via aberrant expression of various cell cycle genes is one of the most essential features in multiple cancers. Therefore, cell-cycle-regulated genes are considerable targets in cancer therapy . Through this study of the mRNA expression of 122 cell-cycle-associated genes, we demonstrated a molecular profile, which defined five genomic clusters of GAC. Among them, cluster 1 manifested the worst survival and was characterized by dramatically elevated expression of WEE2 and CCNE1. WEE2 is an oocyte-specific protein tyrosine kinase that phosphorylates and inhibits CDK1, and acts as a key regulator of meiosis during both prophase I and metaphase II . In GAC, WEE2 might play a similar role by mediated the CDK1 phosphorylation. Amplification of CCNE1 (G1/S-specific cyclin-E1) is associated with poor outcome in breast, lung, and other solid cancers . However, prognosis implication analysis of single genes did not show any correlation of unfavorable outcome and highly expressed WEE2 and CCNE1 (P = 0.4349 and P = 0.2887, respectively). This discrepancy revealed that WEE2 and CCNE1 were indirectly regulated the GAC by triggering other molecular events. In entire GAC cases, we detected that elevated ESPL1 and MCM5 expression were significantly associated favorable prognosis, and the expression variability were reversely consisted with stage progression. ESPL1, a protease (Separase) encoded gene, was reported overexpressing in mammary adenocarcinomas and related to tumor initiation and progression, but not mentioned in GAC . According to cleavage of cohesin complex subunit, ESPL1 might promote metaphase/anaphase transition during the cell cycle in GAC . MCM5, minichromosome maintenance complex component 5, which encoded protein is involved in the initiation of DNA replication and the effect might reduce the accumulation of genetic variation in GAC. The prognostic analysis of MCM5 in current study showed that the upregulated MCM5 was associated with a favorable prognosis. This result was in accordance with an previous immunohistochemical study, which suggested that patients with high MCM5 expression had significantly shorter survival times and MCM5 was associated with clinicopathological parameters in gastric adenocarcinoma . Besides, additional 13 genes specifically expressed in cluster 1 were also correlated to tumor stage. The regression analysis showed that ESPL1 and MCM5 was positively correlated (Person = 0.419389, P = 1.75479E-10) and both them were correlated to other cell cycle-specific genes expression, suggesting a co-regulation effect through genes expression changing in GAC. Although previous studies revealed the significant role of cell cycle associated genes in gastric cancer, most works were focus on individual genes [23–25]. In current study, we discuss the panorama of cell cycle associated genes in GAC samples. Those results might appeal to the further studies of various cell cycle inhibitors with therapeutic potential. For example, evaluation of cell cycle derangement in thyroid tumors may serve as a useful tool for both DTC diagnosis and prognosis ; PLK1 and AK inhibitors display the potential for being employed in innovative therapeutic strategies for improving T-ALL patient outcome ; Inhibition of Aurora and Polo-like kinases suggest that targeting G2-M regulators may represent a novel approach for treatment of human . Irrespective of tissue origin and adjuvant therapy, this work revealed the gene expression profile of cell cycle association in GAC. The impact and functions of distinctive genes need to be further investigated. We believe these results will facilitate the exploration of novel therapies, ultimately improving clinical outcome from this intractable disease. Dongya Wang and Haige Zhu contributed equally to this work. This work was funded by the National Natural Science Foundation of China (Nos. 81702355, 81372387, 81572820). The datasets analysed during the current study are available in the TCGA repository (http://www.cbioportal.org/). DW designed the current study. HZ analyzed and interpreted the data. XF, SH and KY collected the data. JS, JW and ML performed the examination and the sorting of the clinical information. HX performed the statistical test. MG and ZL writing the manuscript. All authors read and approved the final manuscript. Data obtained from the TCGA open-access database was collected from tumors of patients who provided informed consent based on the guidelines from the TCGA Ethics, Law and Policy Group. Additional file 1: Table S1. Gene listed in KEGG cell cycle pathway (hsa04110). Table S2. Comparison of Survival Curves of each cluster by Log-rank (Mantel-Cox) test. Table S3. Comparison of individual gene expressions of each cluster. Table S4. Correlation between Cluster-specific genes expression and tumor stages. (DOCX 24 kb). Additional file 2: Figure S1. Networks of cell cycle associated genes. The interaction values between each connected gene were exported from String-db. (TIF 1159 kb).